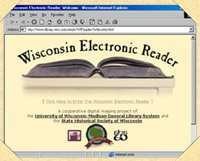 The Wisconsin Electronic Reader is a cooperative project of the University of Wisconsin General Library System and the State Historical Society of Wisconsin in celebration of the sesquicentennial of Wisconsin statehood. Original Material selected and compiled by Betty Ferris, editor. Questions or comments about this site should be directed to the Digital Collections Center, University of Wisconsin Libraries.